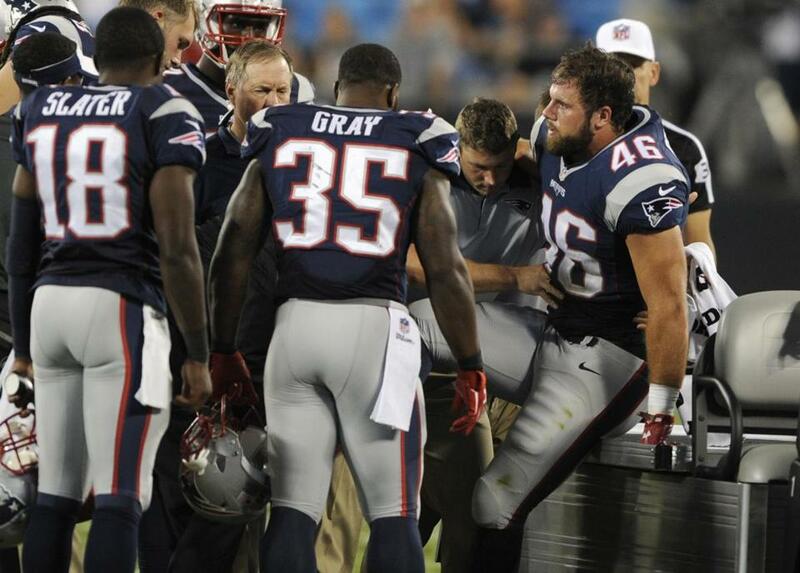 As James Develin is helped onto a cart, Bill Belichick (center) and Patriot teammates huddle near Develin. CHARLOTTE, N.C. — The Patriots suffered a devastating blow in Friday night’s 17-16 exhibition win over the Panthers at Bank of America Stadium when valuable fullback James Develin suffered a potential season-ending injury. According to a team source, Develin broke his right leg after making a 10-yard reception from Jimmy Garoppolo midway through the fourth quarter. Develin rolled to his left and snagged the pass before taking a hit from Carolina linebacker David Mayo. Develin landed awkwardly and his leg appeared to bend back. After being attended to by several members of the medical staff of both teams, a cart was summoned to take Develin off the field. An extremely popular player in the locker room, many of Develin’s teammates, including longtime captain Matthew Slater and tight Michael Hoomanawanui, as well as coach Bill Belichick came out to check on him before he was taken off the field. Develin, a former defensive lineman at Brown, was signed as a free agent by the Patriots in 2013 and has carved out a niche role in the offense. An excellent blocker, Develin also has chipped in with an occasional catch and rush. He scored a touchdown on a 1-yard pass from Tom Brady in last year’s AFC Championship Game win over the Colts.